2019. 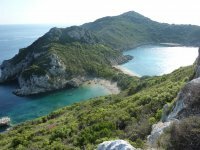 Our guided walking holiday in Corfu is special. Colours, flavours, a mix of history and culture, we will absorb it all from Wednesday 9th October 2019 - 18th October. 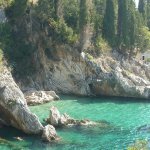 We will be staying in two popular hotels for 9 nights total, 9th -18th October 2019, 6 in Corfu Town, 3 in Kassiopi historic village on the north east side of the island. 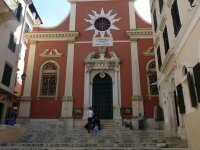 The first is the Bella Venezia in Corfu Town (Kerkyra). 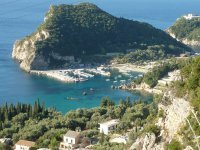 It is positioned in a quiet back street close to the centre of Corfu Town with wonderful views, facilities and an extremely family friendly atmosphere. It is a perfect hotel for our first few days of walking. 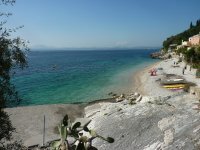 The second is the recently opened Melina Bay Hotel in the historic coastal village of Kassiopi. The views are unsurpassed and there is no better place to sit and relax after a days walk than in the bar and restaurant or from your balcony that overlooks the sea looking towards the Albanian coast. Agii Deka- the second highest mountain on Corfu we take a slow walk up to 576m with wonderful views back to Corfu Town and a 360 degree view of the island. We also walk through the village of Ana Garouna perched on the hillside. Lake Korission- a Venetian built freshwater lagoon 5kms long and 1km wide with 120 species of birds recorded here and many other wildlife species and flowers. A haven for natural historians. Angelokastro- A fortress atop a rocky outcrop named after the Despot of Epirus who ruled Corfu in the 13th Century as a defence against pirates. 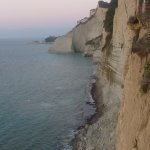 The views are spectacular and it is one of the "must see" places on Corfu. 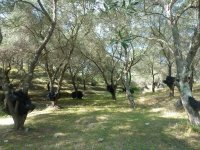 Makrades is the local crafts centre a short distance from Angelokastro through the olive groves. 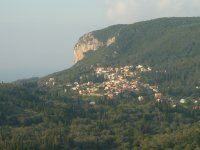 Paleokastritsa is one of the the jewels in Corfu's crown. Wooded headlands and inlets off deep azure blue water best seen from high above, reached by windy country roads. We visit Paleokastritsa and take full advantage of the views from above in Lakones a hillside village where we stop for a break before our days walk. What a start to the day! 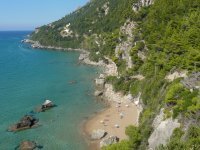 Porto Timoni (pictured right) which has twin bays of sand and rock, a beautiful path to walk from the village of Afionas and a chapel hewn into the rocks in the bay. Myrtiotissa (below) is a beautiful beach described as the best in the world by Lawrence Durrell. The water is as clear and as blue as one imagines an island idyll to be. Kaminaki to Avlaki along the north east coast where we walk and enjoy wonderful bays, beaches, chapels and the White House where Lawrence Durrell lived and wrote Prospero's Cell the definitive Corfiot novel. 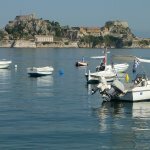 Corfu Town is where we stay for 6 nights and it includes numerous churches, palaces, fortresses and museums that must be seen. 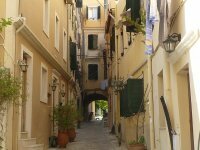 Old Corfu Town (The Campiello) is a maze of narrow streets and alleyways which was first settled in the 10th Century. 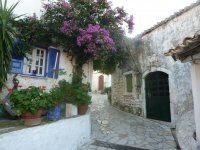 Just wander the alleyways and catch the real essence of Corfu life. It is a joy to lose oneself in this district and soak up the corfiot atmosphere. Pure joy. 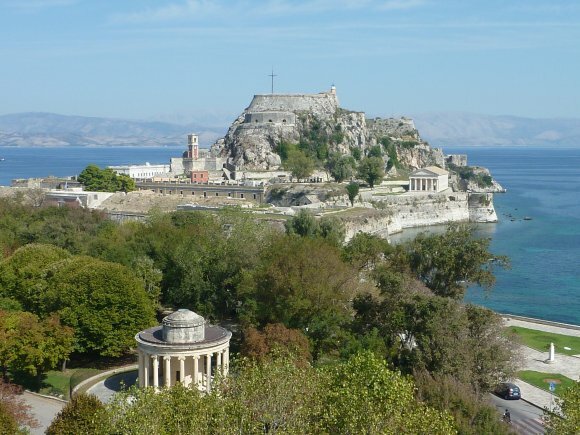 The Old fortress in Corfu Town was built up by the Venetians and affords wonderful views of the town and the coastline. The Liston is an arcade of boutiques restaurants and coffee houses where people meet, sit and watch the world go by whilst the British Cemetery in Corfu Town is also the place to go to see orchids in spring time.